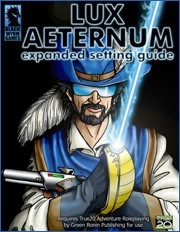 Lux Aeternum: Expanded Setting Guide explores the futuristic world initially presented in Green Ronin's True20 Adventure Roleplaying book. Lux Aeternum is a cinematic science fiction setting that strives to evoke the romanticized spirit of the 17th Century Age of Exploration—a time of sweeping changes, social upheaval, and limitless opportunity. Action, drama, and grand adventure are key elements to any grand tale to be told in this setting. The absence of faster-than-light travel limits the playing field to a handful of star systems and allows this finite area to be fleshed out with a level of detail and complexity not possible in a galaxy-spanning saga. Sign in to start a discussion about Lux Aeternum Expanded Setting Guide (True20)!